The remaining brick schoolhouse is one of a few historic buildings that remain of the small community that was here during the canal era. Along with a post office and a few houses, the schoolhouse was a central point of Four Locks. 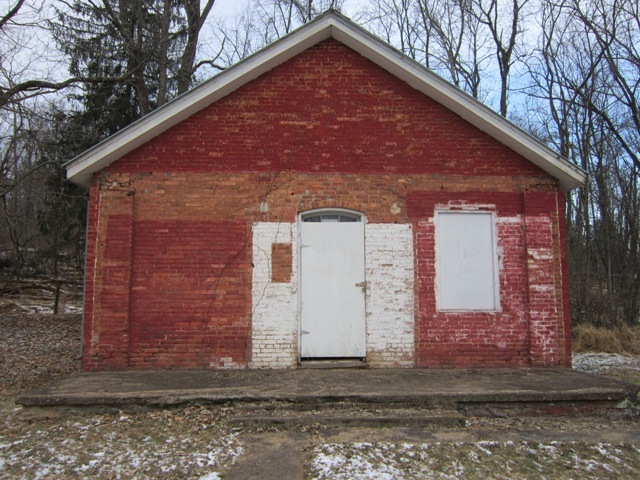 Operating from 1877 until 1943, this building stands as a reminder of the days of the "one room schoolhouse." Up to thirty children in eight grades attended for $240 a year. Things we take for granted today - central heat, electricity, indoor plumbing - were not found here. Instead, oil lamps provided light, the pot-bellied stove provided heat, and one had to venture outside into the heat or cold to visit the outhouse. Besides learning, students had additional responsibilities such as being required to stack firewood for the stove and carry drinking water from the well located near the canal.